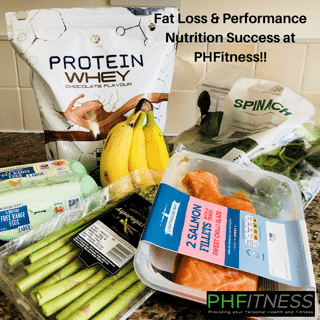 Last Week’s Fat Loss & Performance Nutrition Successes!! Another PHFitness Client Hits The 10Kg Fat-Loss Milestone!! We had a huge week last week here at the private PHFitness 1-1 personal training and sports massage studio in Derby!! Another one of our clients hit a huge weight-loss mile stone with us and has now lost a massive 14.5kg of FAT (yes that is fat!) since beginning her journey with us!! One of our One Nation professional boxers who fights for his first professional title soon, has now hit nearly 6kg of FAT loss since beginning his performance nutrition programme with us and is looking super lean, strong and explosive!! Our 1-1 personal training client who has lost a massive 14.5kg of fat with us since she began has been an absolute joy to coach not only with her training, but also her nutrition too. The key to any long-term result when it comes to health, fitness and nutrition is the ability to listen, take on new information, create a sustainable lifestyle and to be adherent. Our female client, who will remain nameless as I just know that she would be hugely embarrassed if I named her, has worked so hard to achieve her goals. She has listened to every single piece of training and nutrition advice given to her and held herself 100% accountable to her goals. These goals have been achieved while still maintaining a social life and enjoying nights out with friends and family, which in my opinion, is the key to getting lasting results. Not only has our client lost a huge amount of weight, she has also changed the shape of her body along with it through well planned 1-1 personal training sessions which have included a large amount of resistance training and compound weight lifting. This way of training was also completely new to our client but she fully trusted our methods and is now reaping the rewards of a completely transformed body. And the most satisfying part about her body transformation? She is now happy in her own skin and enjoys what she sees in the mirror when she looks back at herself!! That is what makes me tick as a coach!! We began our work with this individual at the start of his training camp as he prepares to fight for his first professional title in just under two week’s time. Our job with this fighter was to safely bring him to his fighting weight while keeping him strong and explosive. I see so many professional boxers draining themselves to make weight by not having the correct knowledge and performance nutrition plan in place at the start of a training camp. They then make weight in an unsafe way and by the end of their training camp, when they should be at their strongest, they actually finish their training camp weak, drained, under nourished and dehydrated. For any professional athlete this is hugely dangerous, but for a combat athlete, it can be catastrophic. Forget the athlete under performing and feeling weak, the athlete can potentially put themselves in a dangerous and sometimes life-threatening position. I think the take home point from this blog is that being teachable as a client, being open to new methods and most importantly, being adherent to the process is the absolute key to any successful health, fitness or nutrition journey. Consistency is key and although it is not always easy, should always be the focus on any journey through health, fitness and nutrition. 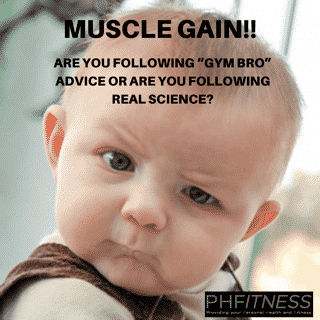 Muscle Gain… “Gym Bro” Advice or Real Science?